Display your favorite memories on your Christmas tree with this fabulous personalized family photo ornament this holiday season. This family photo ornament is a wonderful way to remind your loved ones how much they mean to you during the holiday season. Created from flat sided ceramic, this personalized ornament features the special photograph of your choice, your family initial, and up to two lines of your name, greeting or favorite sentiment to make a one of a kind decoration that is sure to be loved. The family photo ornament will look spectacular on your tree this holiday season, or give them as gifts for everyone on your list. 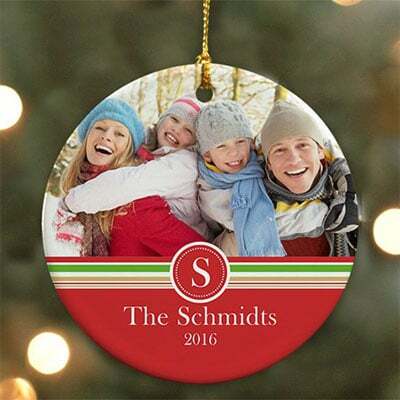 Printed on a single side and measuring approximately 2.75 inches in diameter, these personalized decorations are perfect, for both large and small Christmas trees or ornament stands. Order yours today and enjoy free personalization, fast shipping and a price of just $13.64.